On Saturday, March 9, 2019, cyclists from around the country will descend upon Governor’s Harbour, Eleuthera, to participate in Run and Ride for Hope with one goal in mind: eradicate cancer in The Bahamas. The annual fundraiser offers outdoor enthusiasts the opportunity to bike 100 miles around the stunningly beautiful island of Eleuthera, all while raising money to assist Bahamians in the fight against cancer. “The distance you ride is entirely your choice. Every participant has a highly personalized journey,” said Lana Rademaker, Chief Brokerage Officer for Damianos Sotheby’s International Realty. Since launching 13 years ago, the event has raised more than $3,000,000 through the generosity of individual and corporate sponsorships. This year marks the seventh year that Damianos Sotheby’s International Realty has been a sponsor of Ride for Hope and the fourth year that the company has contributed $10,000 as a Yellow Jersey Corporate Sponsor. Keeping Hope Alive. 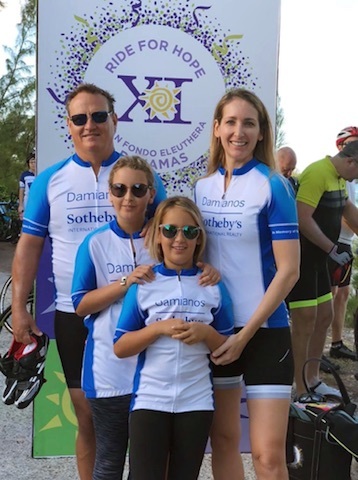 Lana Rademaker, far right, Chief Brokerage Officer for Damianos Sotheby’s International Realty, participated in the 2018 Ride for Hope in Eleuthera along with her husband and two daughters. This year’s Damianos Sotheby’s International Realty team will be the biggest ever in the seven years the company has participated. Donations raised by the run and bike-a-thon support the Treatment Assistance Fund which helps cancer patients with their treatment costs through financial grants. Donations also contribute to programs such as the Cancer Society’s nationwide Cancer Education Program, a grassroots outreach effort that sends trained nurses to communities throughout The Bahamas to educate, raise awareness, and teach self-screening and good health choices. “Cancer has directly touched the lives of everyone in our company, whether personally or through a loved one’s battle,” Rademaker said. Damianos Sotheby’s International Realty has 10 offices located throughout the islands of the Bahamas, providing unsurpassed market knowledge of Abaco, Eleuthera, Harbour Island, Exuma, Nassau, Paradise Island, Ocean Club Estates, Lyford Cay, Old Fort Bay, Albany and Private Islands. Head office 75 Shirley Street, Nassau. For additional information, please contact 242-322-2305 or info @SIRbahamas.com. The Sotheby’s International Realty network currently has approximately 22,000 affiliated independent sales associates located in over 970 offices in 72 countries and territories worldwide. Each office is independently owned and operated.